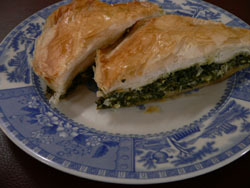 Spinach Pie or in Greek, Spanakopita. It can be served as an appetizer, side dish or as a light meal of its own for a ladies luncheon. I have made this dish a couple of different ways depending on how I am serving it. Prepare the spinach and herb mixture a day in advance so excess moisture has time to drain out. Over Medium heat, saute the onion and dill in olive oil in a large soup or stew pot until soft. Add water, parsley and spinach. Bring to a boil. Cover, reduce heart to low and cook for 20 minutes, stirring occasionally. Put spinach mixture in a colander to drain. When cooled, cover and continue to drain in the refrigerator overnight. melted butter for brushing dough. Add beaten egg and crumbled feta cheese to the spinach and toss until evenly distributed. I like to use a couple forks to toss. With a pastry brush and the 2 Tbl of olive oil, brush a pan that measures about the same or little less than the size of the phyllo sheets. Unroll the phyllo and count out 6 sheets laying in prepared baking pan, and brush lightly with the melted butter. 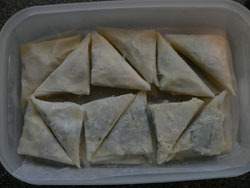 Lay another 6 phyllo sheets on top, brush with melted butter, and repeat process with 6 more phyllo sheets. It is ok if the sheets overlap the pan. Spread spinach and cheese mixture into pan and fold overhanging dough over filling. Brush with melted butter, then layer remaining (less 2 sheets of dough) phyllo sheets 6 at a time, brushing each 6 with melted butter. Tuck overhanging dough into pan to seal filling. Final 2 sheets cut with scissors to fit the pan and lay on top for smooth finish. Brush with butter. Cut into serving size pieces, cutting all the way through to the bottom. Best to use a sharp knife so the dough stays nice in place. Bake 30-40 minutes or until golden brown. Cool slightly, cut and serve. Spanakopita can be served hot, warm or even great cold. 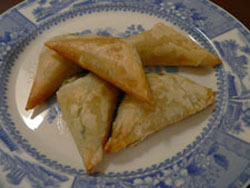 A variation of Spanakopita is to fold the dough into triangles, making a great finger food as an appetizer. Lay 2 sheets of dough on a cutting board, brush with melted butter and cut into strips. Put about two spoon full of spinach filling on one end of one strip of dough. Fold the dough like a flag. You can make the triangles any size you like. These that I have made are about 2 to 2 1/2 inch x 14 inch strip of dough and about 2 Tablespoons of filling. I like to make the triangles and keep them in the freezer for an impromptu get together with friends. I have even made petite pies in about 6 inch round pans. Just cut the dough to the size you want for the size pan you intend to use. If you are going to freeze, do not bake it. Wrap well using plastic ware, freezer bag or wrap. When you are ready to use, thaw, brush with butter and bake as needed.